Boring salads are sad. 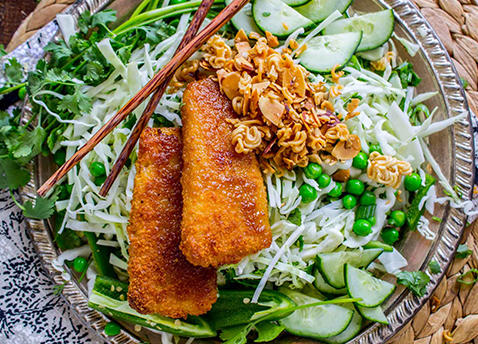 But this cabbage salad from The Food Charlatan topped with Crunchy Breaded Fish Fillets, crispy ramen noodles, and a tasty vinaigrette dressing is anything but. Preheat your oven to 350°F. Begin to thaw peas. Dressing: in a small pot over high heat, stir together the apple cider vinegar, olive oil, sugar, and soy sauce. Once the mixture has come to a boil, cook for about 30 seconds until the sugar has dissolved. Add the minced ginger and then remove from heat. Transfer to a mason jar or tight tupperware, and store in the fridge until cool. Make the crunchies: Melt the butter in the same pot you made the dressing in, or melt in a medium mixing bowl in the microwave. Use your hands to break up the ramen noodles BEFORE you open the package. You want small chunks, it shouldn’t be crushed to a powder. Add the dry ramen noodles, sesame seeds and almonds into the pot with the melted butter and stir. Spoon the mixture onto a baking sheet and spread out into one layer. Bake the ramen noodles and almonds for about 5 minutes. Open the oven and use a spatula to stir the pan. Bake for another 2 minutes, then stir again. Repeat until the noodles and almonds are slightly toasted and light brown. The total time in the oven is about 10-12 minutes. Be careful and keep an eye on it, it can go from browned to burned real quick. Transfer the noodles to a bowl and set aside. Meanwhile, prep the salad. Shred the cabbage into thin strips. Chop the cilantro, green onions, jalapeños, and cucumber. Combine cabbage, cilantro, green onions, jalapeños, cucumbers, and thawed peas in a large bowl. Toss the ramen noodles and almonds in with the salad. Toss with dressing. (You don’t have to use all the dressing). Top each plate of salad with 1-2 fish filets. 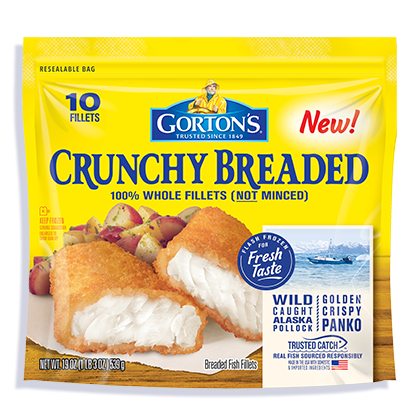 Flaky, wild-caught whole Alaska Pollock fillets in a golden crunchy Panko breadcrumb.